Japanese Music Quiz Game: Free KanjiBox iTunes Coupons! 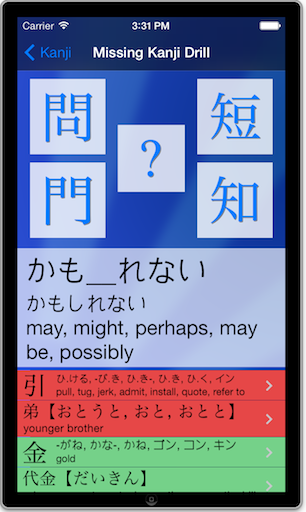 To celebrate the end of JLPT madness (for the time being) and the end of year altogether, I thought now might be a good time to distribute a few iTunes coupons for a free download of KanjiBox for iPhone. Listen to the 10 Japanese music samples below and identify as many as you can. First 3 people with the highest number of correct guesses (out of 10 artists + 10 track names) win 3 iTunes coupons, each, for a free download of KanjiBox for iPhone. On Friday (Dec. 11) evening, Kyoto time, I will post the answers here and name the lucky winners. All these tracks are performed by one or many Japanese artists and rank from the super-obvious to the slightly more obscure, but are all rather popular in their own genre. Feel free to team up to multiply your chances at identifying them all (there are 3 free coupons per winner, to be shared however you see fit if you win as a team). Note: because of restrictions placed by Apple, free application coupons on the iTunes Store can only be redeemed with the US Store. However, I believe it is possible to temporarily change your store affiliation to claim a coupon. This entry was posted on Saturday, December 5th, 2009 at 9:51 pm	and is filed under Fun. You can follow any responses to this entry through the RSS 2.0 feed. You can skip to the end and leave a response. Pinging is currently not allowed.